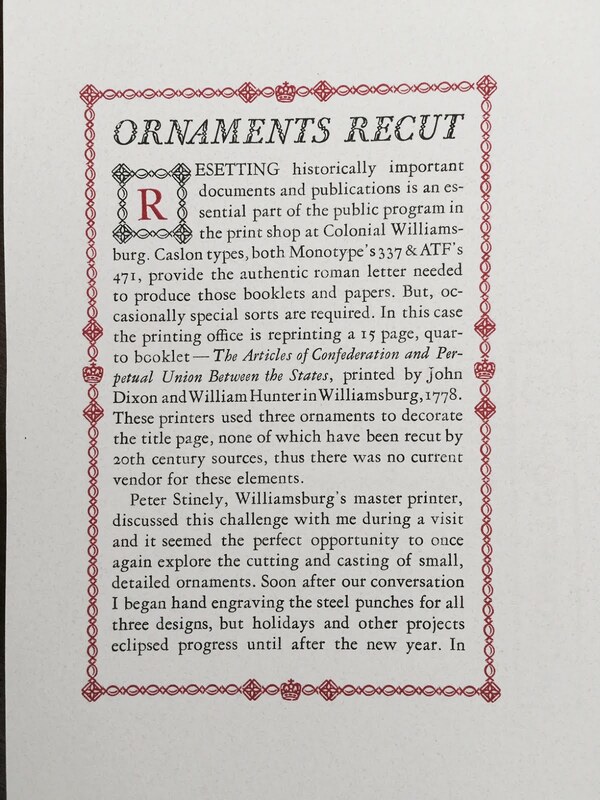 This small page, printed for the 2016 volume of It's a Small World (a printers' specimen exchange) features three ornaments recently cut and cast by hand for Colonial Williamsburg's Printing Office. They are very busy with the project of re-printing a type facsimile of The Articles of Confederation and Perpetual Union Between the States . . . printed by John Dixon and William Hunter, Williamsburg, 1778. 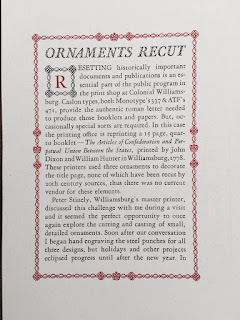 Quoting a communication from their Master Printer, Peter Stinely, "The egg ornament was used by two of the Williamsburg printing houses, first by Joseph Royle in 1763, according to A Dictionary of Colonial American Printers' Ornaments and Illustrations, by Elizabeth Carroll Reilly," (American Antiquarian Society, 1975). Because these typographical elements are not available from any extant typefoundry, in order to create a proper facsimile of the title page of the 'Articles' new sorts had to be made. As a friend of Peter, and the Williamsburg Printing Office, I was happy to take up the challenge of re-engraving the steel punches, striking and fitting the matrices, and then hand casting the type -- using exactly the same methods that were employed in the 18th century. Peter supplied photographs of the original page, I enlarged these and drew over the images with a black pen -- attempting to reduce the effect of 'ink squeeze' seen in the printed ornaments. I then cut a brass gauge to match the type body of 12 points, and its half (6 points). The 'egg' is 12 x 6 points while the other two ornaments fit upon a type body that is 12 points square ( which is an EM width. ) Gauge completed, I filed and polished three lengths of high carbon steel and then laid out the designs upon the shiny faces of the punches. Great care was taken to get all of the proportions correct. 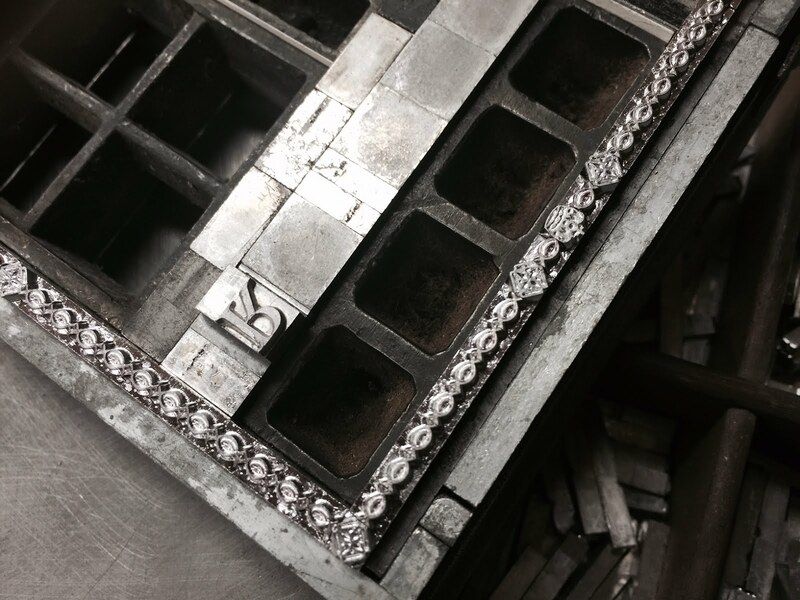 The outside profiles of the ornaments were shaped with files, and the inside components were cut with gravers. The goal of matching the appearance of the original ornaments was achieved through careful observation, methodical engraving, and the use of soot impressions (called smoke proofs) that were taken as the shapes evolved. When the smoke proofs seemed to match the original images that stage of the task was completed. 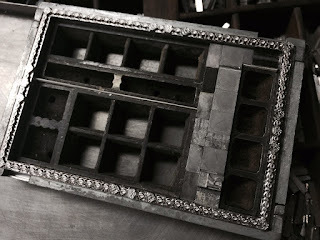 Later, I discovered that two of these three ornaments are shown in specimens of types cast by Edmund Fry's type foundry. I had reprints of Caleb Stower's 1808 Printer's Grammar, and the Printing Historical Society reprint of Fry's 1828 specimen. The Fry foundry was established in 1764 and sold in 1828. So for a document printed in 1778 Fry could well be the source of at least two of the ornaments. But that doesn't explain the egg's use in Williamsburg in 1762. This can be resolved through actual research -- clearly not an hour spent in my limited library. 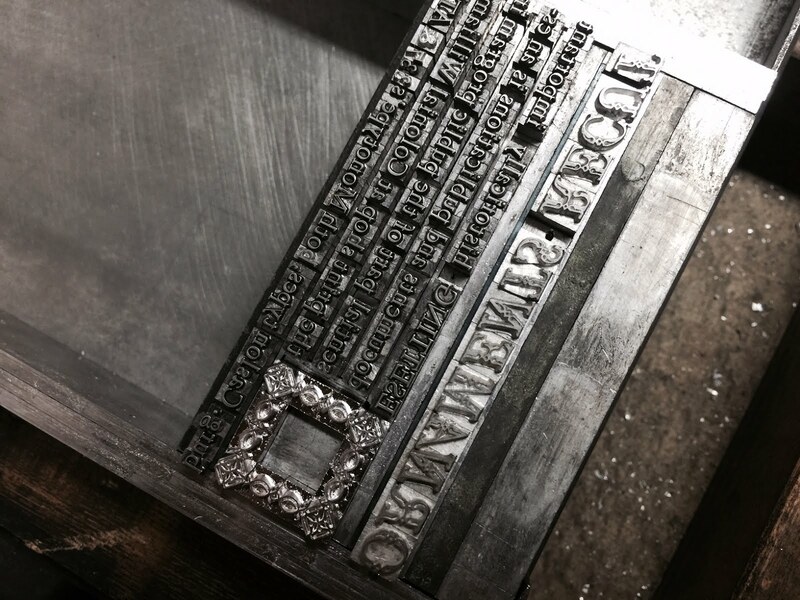 Here is the red forme for the recto side of the leaf, employing 'modern' spacing materials and a rather spiffy, zinc alloy and spring loaded frame used to 'tie up' the page. 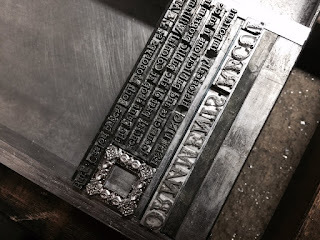 Here is the beginning of the text column for the same recto side of the leaf -- the black forme. I surrounded the initial letter (printed in red) using the same ornaments but printed in black. The display line -- the title of the page -- was set in Fournier le Jeune, a 20th century re-engraving of a set of ornate capital letters cut in the 18th century by S. P. Fournier (called le Jeune). The pearl-like shapes seemed well suited to the design of the ornamental border. But the casting was on excessively wide set widths and most of the letters required extensive kerning. This involved cutting away the sides of the types, leaving portions of the letters overhanging their neighbors. Such details are essential if the final result is to be remotely attractive.